Kinder Morgan plans to ship 400 tankers loaded with tar sands oil each year through the Salish Sea. If the oil spilled, where would it go, and what iconic and ecologically important places could be affected? This map is part of a multi-year research project to better understand the path an oil spill might take, and how far the oil could travel. Since the fall of 2013, we have dropped nearly 6,000 drift cards at over 20 different locations from Burrard Inlet in Vancouver to Race Rocks near Victoria. 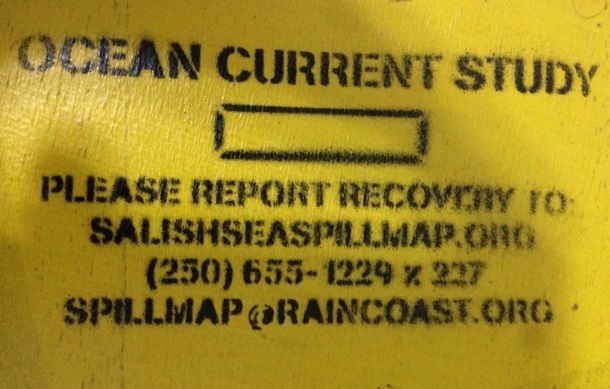 With over 2,200 card recoveries reported, the project will inform spill response planning, oceanographic modelling initiatives, and awareness about the potential impacts of oil spills in the Salish Sea. Get involved! Report a drift card that you’ve found. Or explore the rest of the website to see the map, find out more about the threats to the region, and take action. Please check here if you'd like to stay up to date with news from Raincoast and Georgia Strait Alliance. US energy giant Kinder Morgan’s plan to twin its existing Trans Mountain pipeline would result in over 400 tankers loaded with toxic tar sands oil travelling through the Salish Sea each year. If approved, this project would put the ecosystems, economies and people of the Salish Sea at greatly increased risk of a catastrophic oil spill. If the oil spilled, where would it go? To help answer this question, we are dropping over 1000 small drift cards (4” x 6” pieces of bright yellow plywood, each with a unique serial number) at locations of higher risk of incident along the oil tanker route that runs from Burrard Inlet, through the Gulf and San Juan Islands and out into the Strait of Juan de Fuca. Just like a message in a bottle, the drift cards carry a simple message: this could be oil. When the drift cards are found and reported to us (on this site), their recovery locations will help us to map the paths oil spills might take, and how far the oil could travel. While there are many differences between oil and drift cards, the cards are influenced by both surface ocean currents and wind, much like oil on water. By linking the drop sites to the locations where the cards are found, we will be able to broadly track the card movements, and highlight areas where they accumulate. The data collected will therefore also inform our understanding of which communities, recreational sites, species and habitats could be affected in the event of a spill. Find out more about the science behind the project. The project is a collaboration between Raincoast Conservation Foundation and Georgia Strait Alliance. Our US partner is Friends of the San Juans. The Salish Sea is one of the world’s most spectacularly beautiful and ecologically rich bodies of water, stretching from the Georgia Strait on BC's south coast to Puget Sound in Washington State and out along the Strait of Juan de Fuca. Here, hundreds of rivers meet the sea, creating a unique coastal environment that supports a huge variety of marine life, including wild salmon, endangered killer whales and hundreds of species of resident and migratory birds. The region is home to thriving tourism and fishing sectors that support tens of thousands of jobs in both BC and Washington State. Kinder Morgan’s plan to triple the capacity of its Trans Mountain pipeline to 890,000 barrels per day would increase the number of tankers visiting Burnaby’s Westridge terminal by 500%, from roughly one per week currently to more than one per day. The new pipeline would carry diluted bitumen from Alberta’s tar sands, principally for export to foreign markets. Each tanker that navigates our waters brings the risk of a catastrophic oil spill that would devastate the marine environment, our coastal economy, the “Beautiful BC” brand and Washington’s image as the “Evergreen State”, for decades to come. The provincial and federal governments have both acknowledged that we are not prepared to deal with a major spill of conventional crude oil on BC’s west coast given current traffic levels, and that the insurance available would insufficient to cover the costs of a large spill. The diluted bitumen that would be carried by the tankers adds additional risk and uncertainty: even the Canadian and US Coast Guard have little idea of how this toxic substance would behave if spilled, and therefore whether any recovery efforts would be effective. The tar sands oil - the dirtiest fuel on earth - that would be carried by Kinder Morgan would be responsible for millions of tonnes of carbon emissions each year. Approving the Kinder Morgan proposal would lock BC into a climate polluting path, and send a clear signal to the world: Canada will not contribute to the global effort to reduce emissions and stabilize our climate. Our ocean and our climate are too precious to risk. We need to say ‘no’ to Kinder Morgan, and ‘yes’ to a safer, cleaner energy future. We have successfully received your drift card report and it will be included in our analysis and reporting. Contact us if you would like to check or revise your report. Please email us a picture of the card you recovered (and, if you like, one of you holding it) to contact@salishseaspillmap.org. If you’d like to report the location of a drift card that you’ve found, find out more about the project, or get involved in our work to protect the Salish Sea, please get in touch! Sorry! Something went wrong and your drift card report was not successfully submitted. Please contact us directly with your card information! Card reporting is currently unavailable. It is not currently possible to report a drift card using the spill map. Sorry! We're having a problem with our database, which started January 10th and will hopefully be fixed very soon.